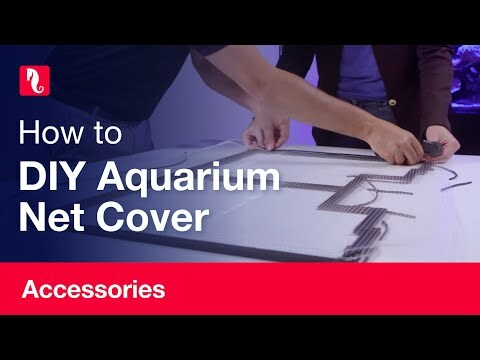 Keep your finny friends safe inside your tank with a customizable Red Sea Aquarium Net Cover. With a sleek profile and minimalist hangers the Red Sea Net Cover blends in seamlessly even on ultra-clear, rimless, open-top aquariums. The extra strong aluminum frame and purpose designed components allow the extra thin transparent net cover to be customized to accommodate rim-mounted equipment such as lighting arms, auto-feeders and overflow boxes. Check out our how-to video that shows exactly how to assemble Red Sea’s fish saver, step-by-step. Keep in mind that this is a Do-it-Yourself cover, and while it offers versatility and customizability at a fraction of the cost of custom-built covers, it does require proper DIY skills including planning, taking exact measurements and cutting aluminum profiles. So if you aren’t a DIY project kind of hobbyist, you can always ask your local dealer or a handy friend to help. Designed specifically for rimless tanks the Red Sea cover also works well with braced tanks such as the MAX® S-series.